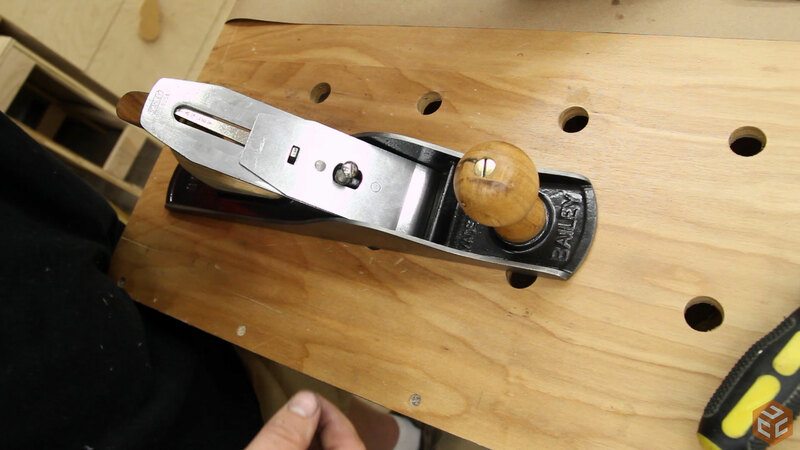 The more I use hand planes the more I value their place in a woodshop. 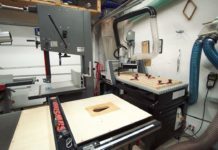 Any woodshop. Even if your primary use is power tools there are areas where hand planes can benefit your work flow. 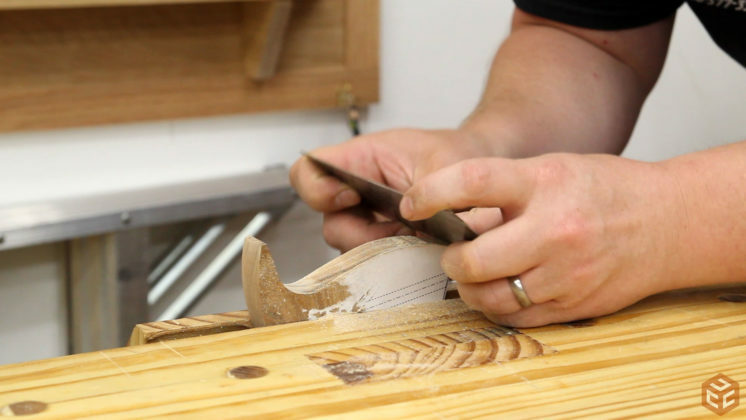 Often times trimming a little bit here or there with a hand plane is more efficient, faster, and leaves better results than sanding. But the object of this article isn’t to persuade you to buy a new hand plane. I don’t have a dog in that race. 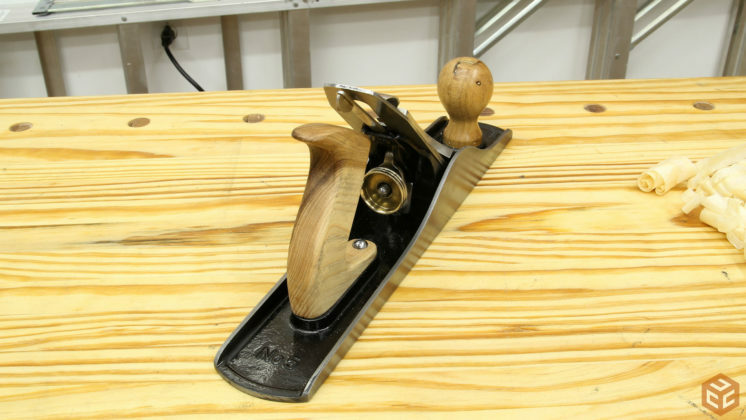 However, you also don’t need to buy a new hand plane to get good results. 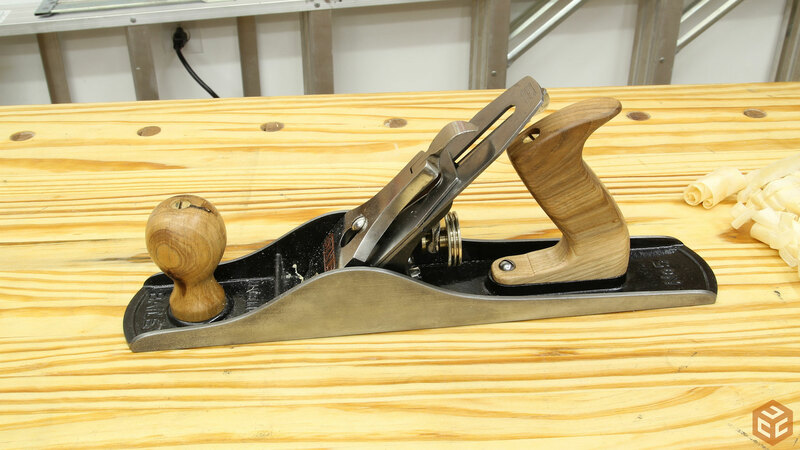 A used plane in good condition will work just as well. Unfortunately, and obviously, not all used planes are in good condition. Some are worse than others and quite a few are too far rusted away to be of any use. In this article I will walk you through the processes I took to restore a friend’s Stanley Bailey #5 hand plane. 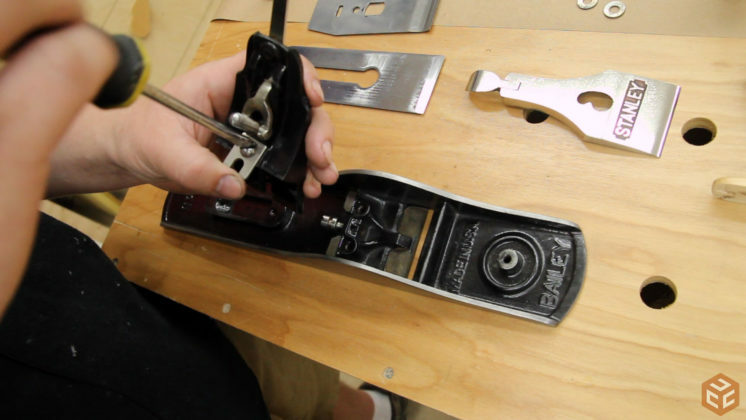 Lets talk about the “before” state of the plane. Both handles were intact but beat up pretty bad. They are made of wood so that’s an easy fix. The rest of the plane was quite rusty but none of the rust was deep enough to cause concern. And finally, the black painted surfaces weren’t beyond salvaging. There wasn’t any flaking anywhere so there was no need to strip the existing paint. 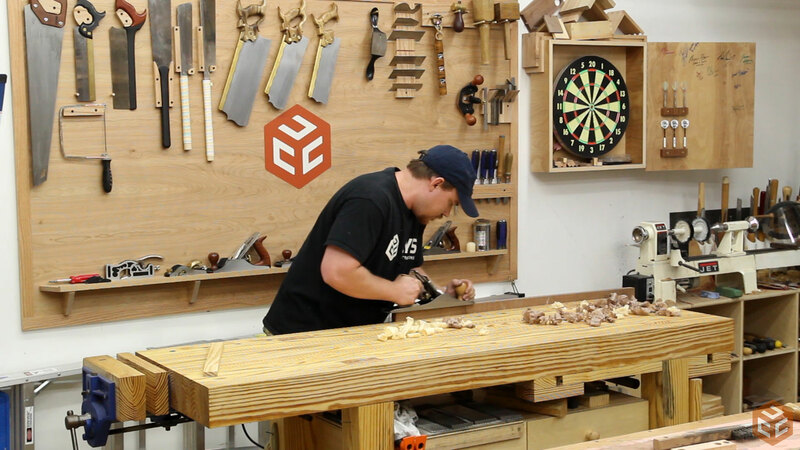 The blade was dinged pretty bad but that can be removed quickly with a grinder. 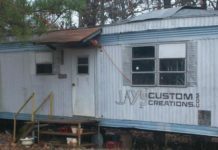 It is a perfect candidate for a restoration job. Step one: Dissemble and assess the parts. 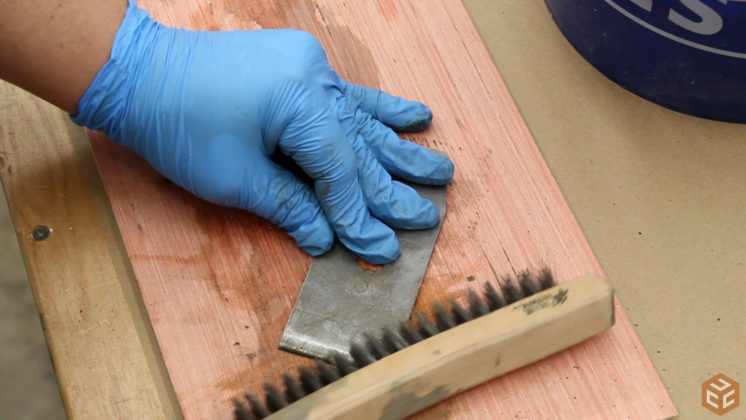 There’s many ways to remove rust on metal. I’ve got no interest in debating which is the best method. I chose to use regular vinegar at full strength because it’s the easiest option. 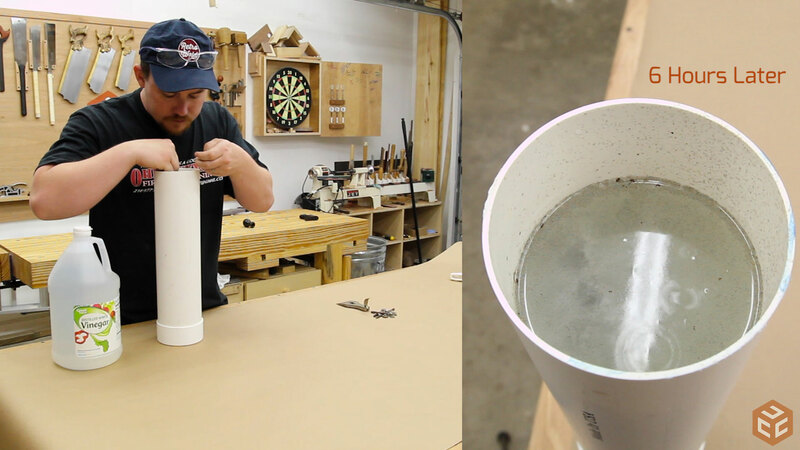 To submerge the parts I glued a cap onto a piece of 4” sewer and drain PVC pipe. This seemed to be the best use of space for soaking the parts. It was also the only thing I had in the shop that would work. I let the parts sit for 6 hours submerged in the vinegar. Once removed from the vinegar all of the surface rust and debris can literally be wiped away with a paper towel. There were a few tough spots that the rag wouldn’t remove so for those I used a wire brush on a sharp angle to give the pieces a gentle scrub. 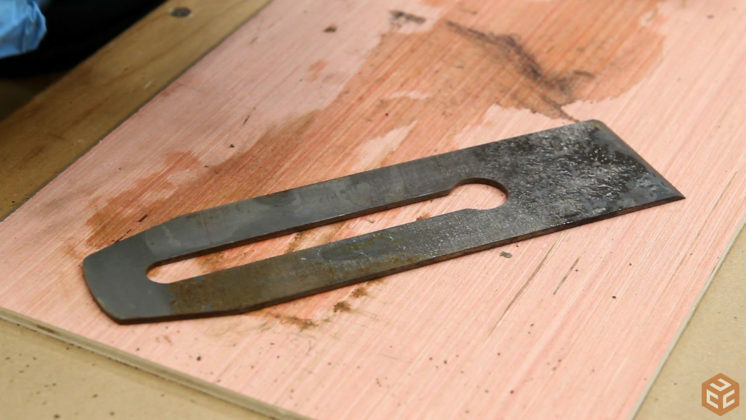 Once the rust is broken free the piece can be dipped into the vinegar once more and wiped clean with a paper towel. The original paint on the plane wasn’t beyond saving. There were no major chips removed or flaking present but there were a lot of slight surface blemishes here and there. After a quick clean of the surface to make sure no debris was hanging around I applied a thin coat of black spray paint to give a consistent top coat. I don’t see a problem using regular spray paint for this. So long as you properly clean the surface, spray thin even coats, and allow enough time for the paint to cure you shouldn’t have any problems. 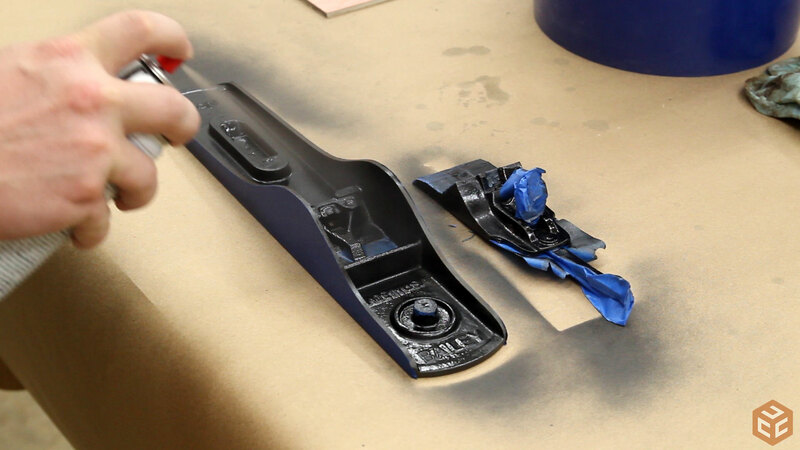 I made sure to mask off the sides and any bare metal areas inside the plane body such as screw locations. While the paint dried I focused my attention on making a new set of handles. 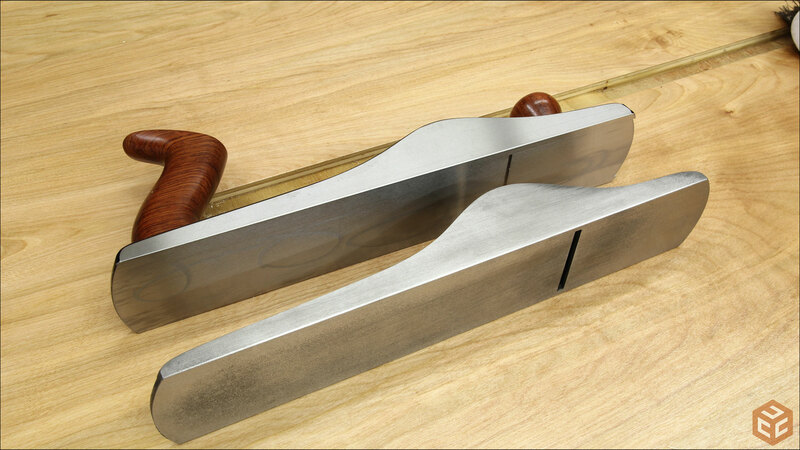 Both handles were made from hickory. First up was the front handle. 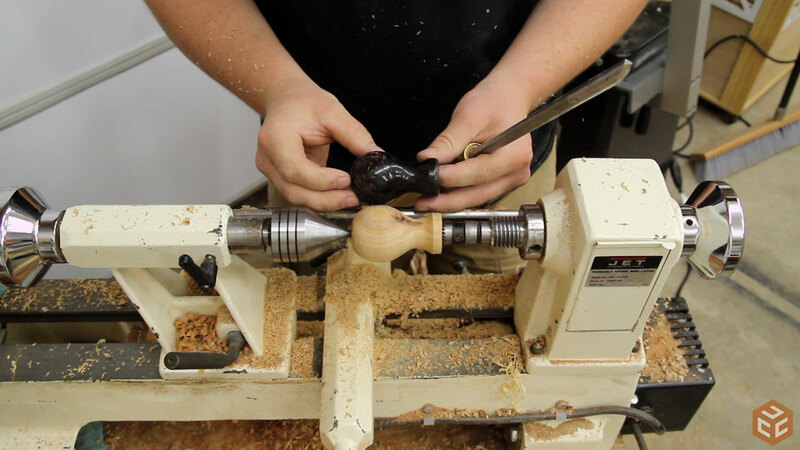 It’s a simple spindle turning on the lathe that can be broken down into a few parts. 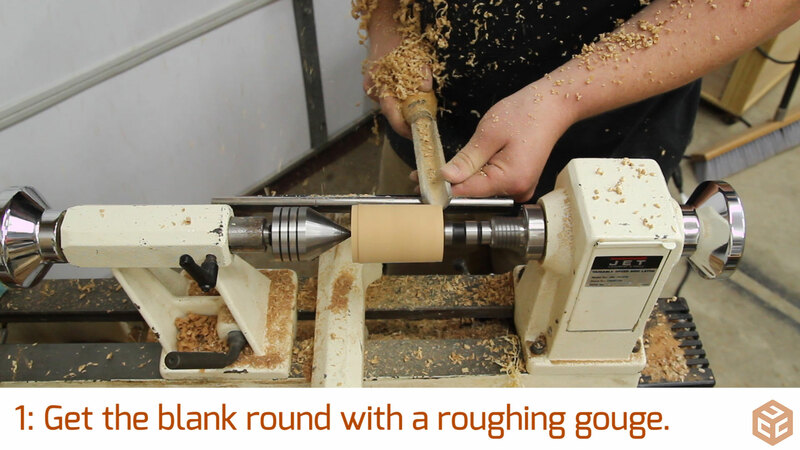 I started with a blank that was the same length as the height of the old handle and roughed it to a cylinder with a roughing gouge. 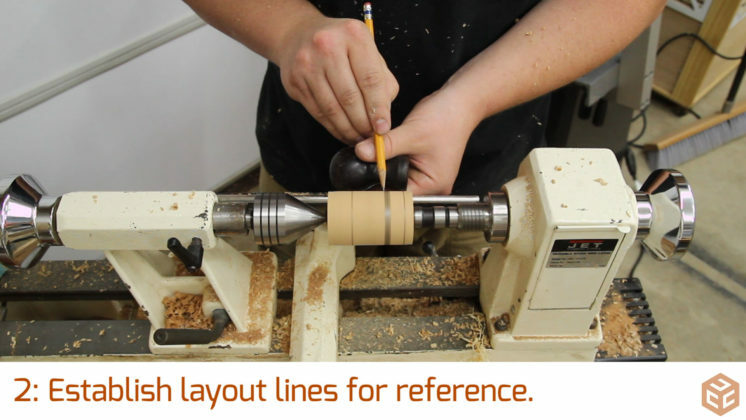 Then some reference lines can be added for high and low spots. A parting tool with the help of a caliper can be used at those reference lines to establish the proper depth at each area. 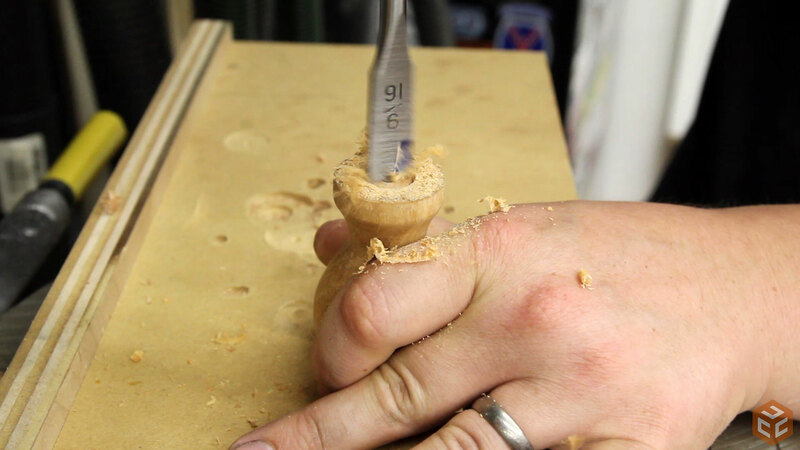 And finally a bowl gouge or a spindle gouge can be used to shape the handle. 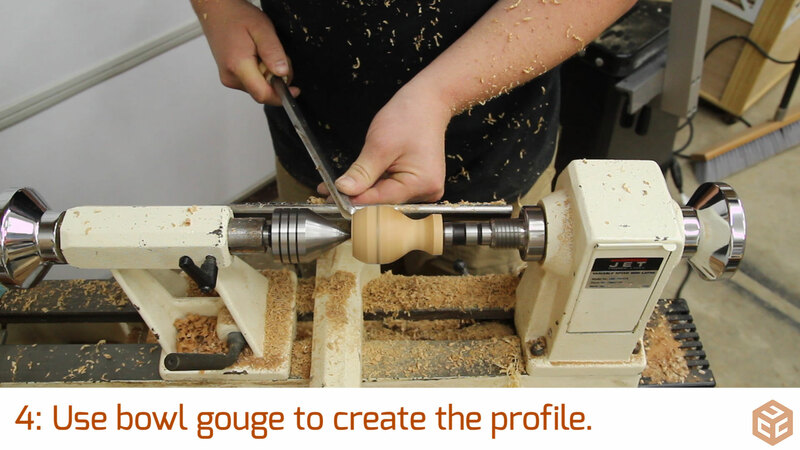 If all went well the new handle will be done in no time. For the rear handle I used a template. Lee Valley has a rear handle template for the exact plane I’m restoring. That’s pretty convenient. After gluing it to a piece of hickory stock I cut to the perimeter of the template lines at the table saw with my crosscut sled. 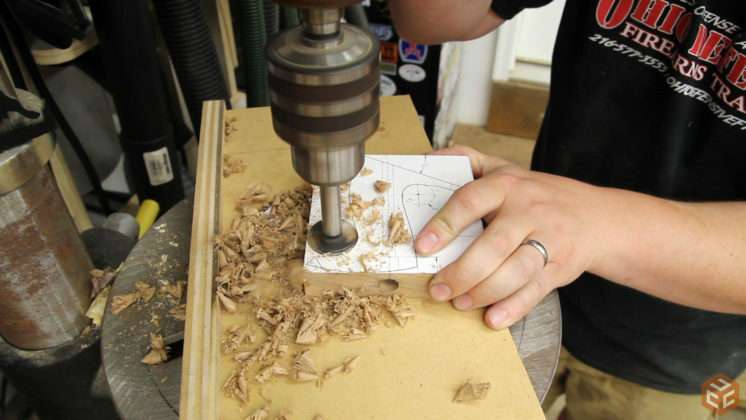 Next up is drilling quite a few holes at the drill press. 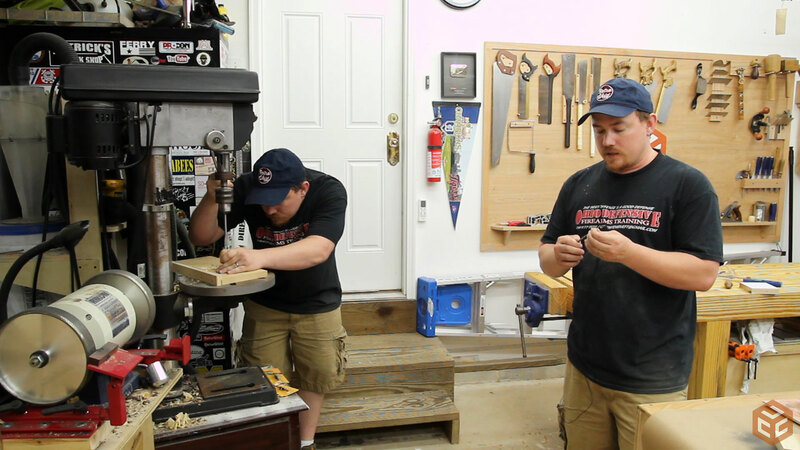 Normally it’s a really bad idea to hold small parts while trying to drill holes at the drill press as the drill bit can catch and then spin the part uncontrollably in your hand causing injury. However, the front handle is a turned piece so there is no danger of it spinning in your hand in the event of a catch. 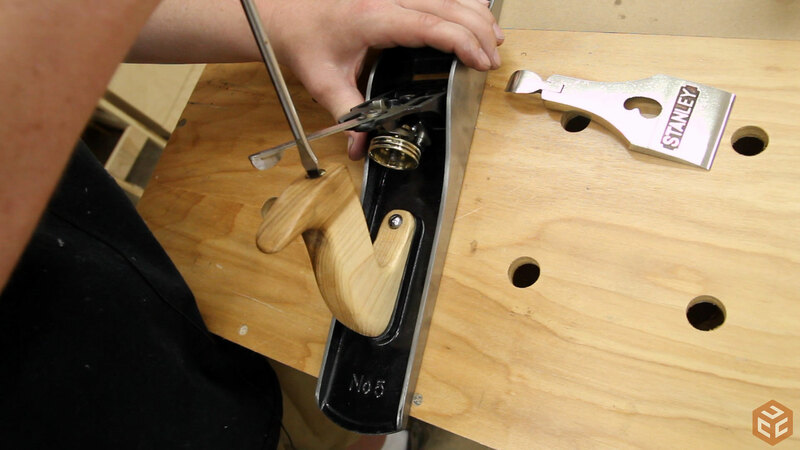 The rear handle has holes in two directions and uses four different bit diameters. After roughing the rear handle shape at the bandsaw I used a couple hand tools to clean up the shape. A card scraper really helped smooth the bandsaw cuts on the curved faces. 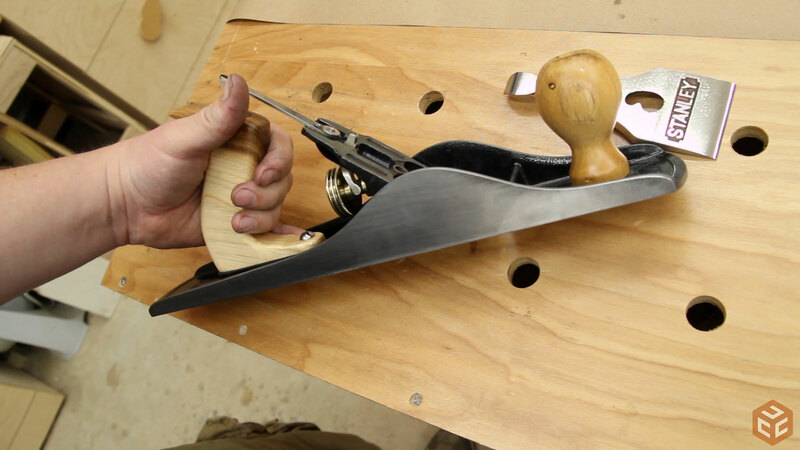 I could have used a router and a roundover bit to ease the edges of the rear handle but I thought it would be just as convenient to use rasps and files for the entire shaping. 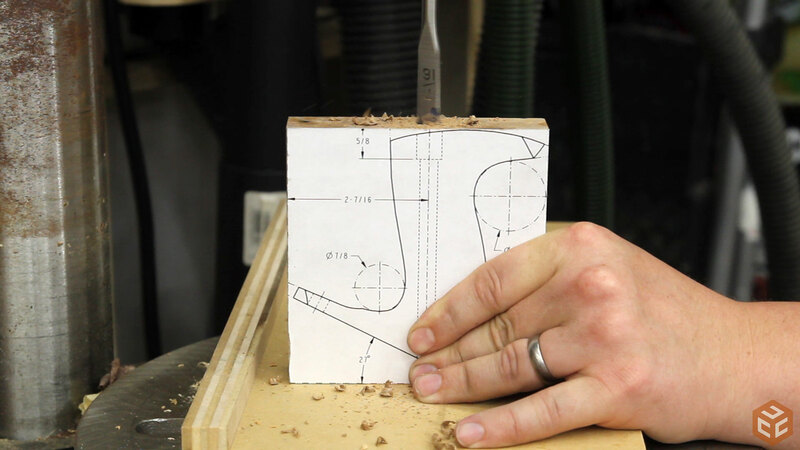 I would have had to use them after the router for final shaping anyway. 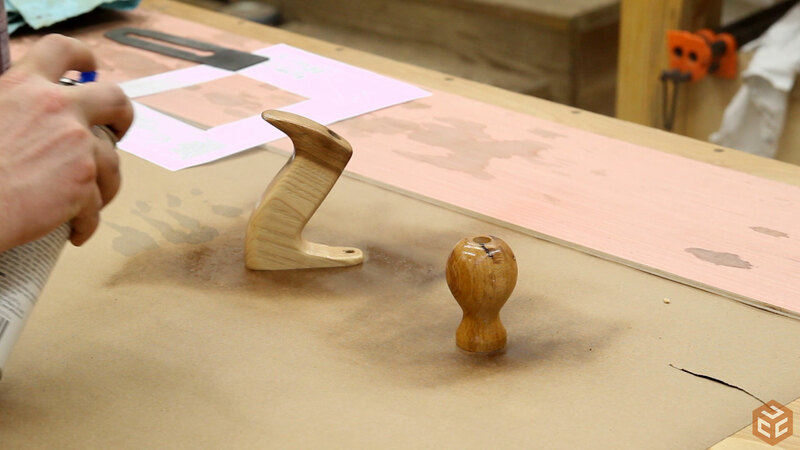 It worked out pretty well and the hickory was a lot easier to shape than I thought it would be. I wanted a finish that was more durable than an oil based finish such as boiled linseed oil so I chose to use spray lacquer. Be careful when using this stuff though as it’s not good for your lungs. I should have been wearing a respirator for this but as soon as I was done spraying I turned on a fan and left the shop for a bit. I wanted to make sure that the paint extended the entire way up the inside walls and would not have been obstructed by any paint so I didn’t mask off the top edges of the sides. They got painted as well. Some 80 grit sand paper and a foam sanding pad quickly removed the paint and cleaned up the tops of the sides rather nicely. 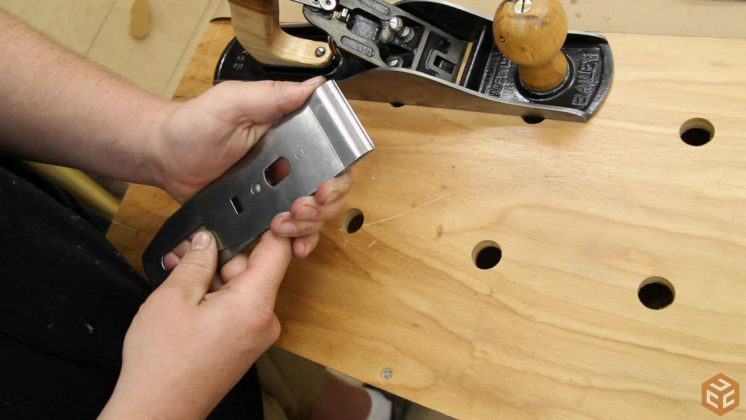 After checking the plane for flatness while resting it on a known-flat surface such as my table saw I determined that the bottom of the plane was already as flat as it needed to be. I still wanted to clean up the bottom and sides though so I stuck some self adhesive sand paper to my table saw and gently cleaned up those faces. I also made sure to sand the long edges of the plane where the sides and bottom meet to remove any sharp corners that could more easily damage a work piece during use. The end result of the sand paper was good enough for me. 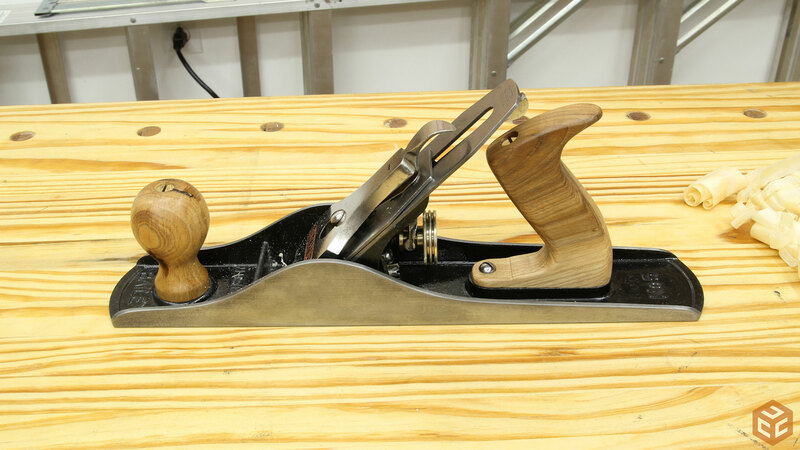 Here you can see the #5 on bottom and a relatively new #62 low angle jack plane on top. Next up is the blade. This blade had one pretty bad ding in it that needed to be removed at the grinder before going to sharpening stones or plates. Before sharpening the blade at the plates I thought it would be a good time to polish the blade, chip breaker, and lever cap. I used a polishing wheel and some buffing compound on my lathe. It worked out pretty well. Finally the blade can be sharpened. 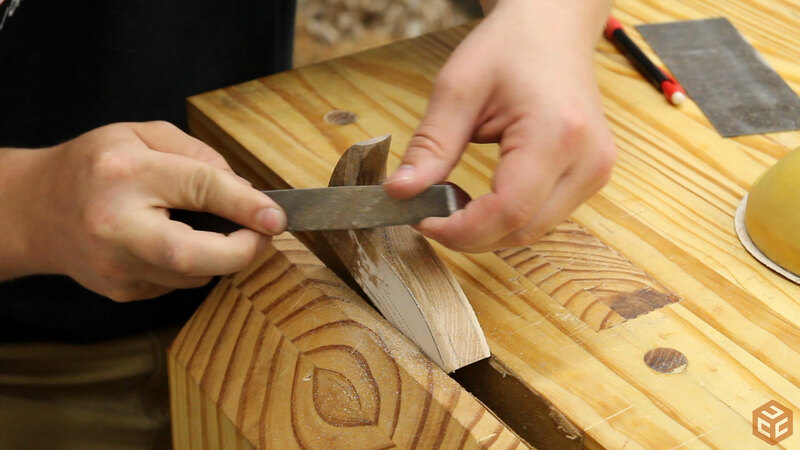 Sharpening an edge can be an entire video and article on its own so I won’t go into great detail here. For those who are interested, I currently use the Paul Sellers recommended diamond plates with the Rob Cosman sharpening method/technique. 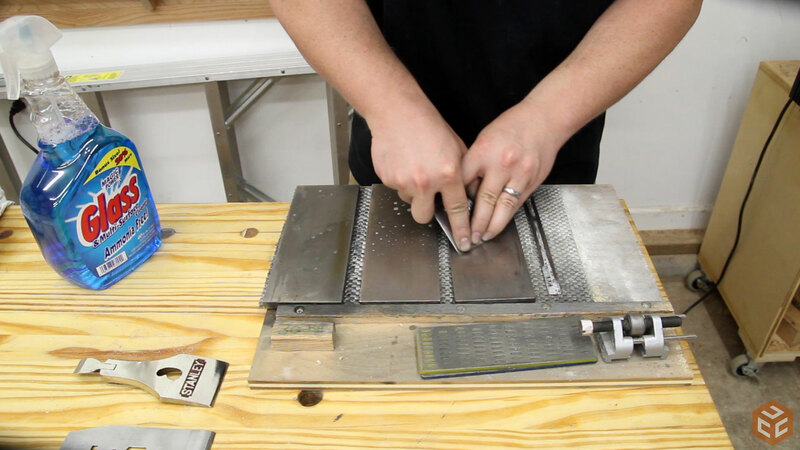 Here’s a link to the plates I use (coarse and extra extra fine) and the following two videos are from Paul Sellers and Rob Cosman. When sharpening the front of the iron a small wire burr should appear on the back of the iron. 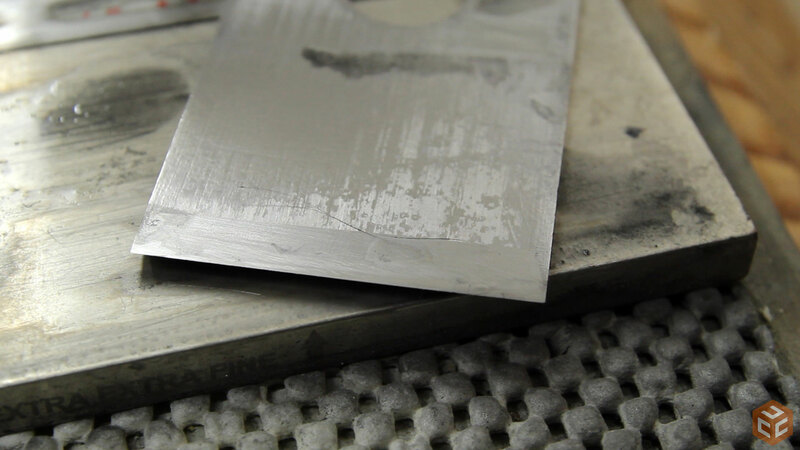 Once the burr is removed the iron is razor sharp. 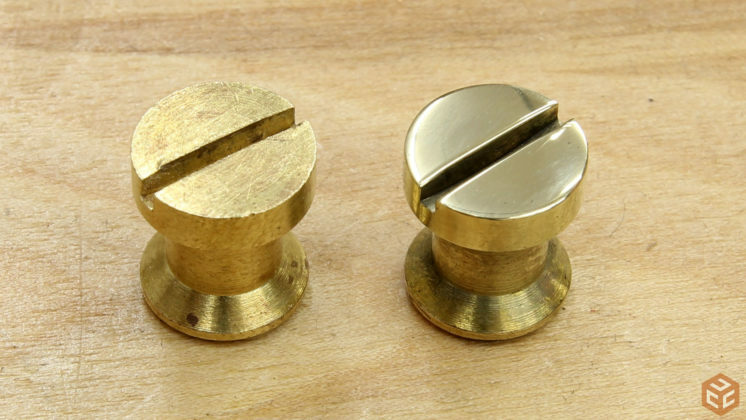 All of the brass can be polished at the buffing wheel as well. Brass polishes so nicely. 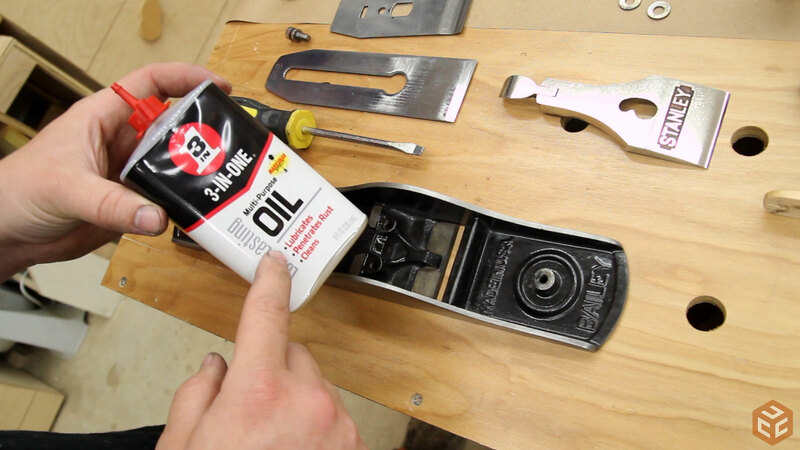 Before assembly I made sure to put a drop of 3-in-one oil on all of the threaded parts to prevent rust long term and also make assembly slightly easier. There are a few different terms for parts of a hand plane. 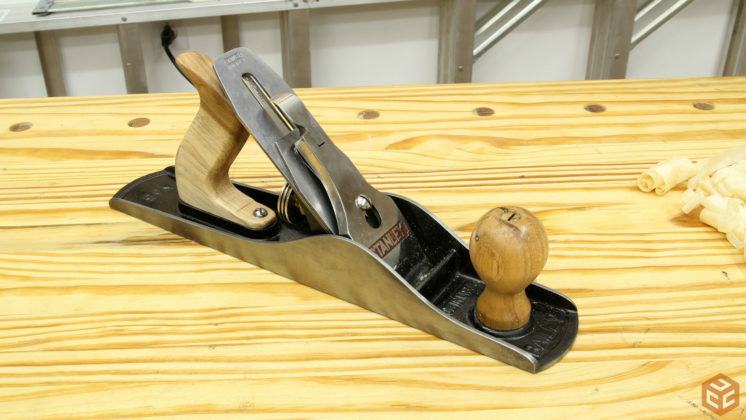 For a full list of terms simply search Google images for “hand plane parts.” The first piece installed is a screw that will adjust the frog forward or backward. There is a clip that interacts with the previously installed screw and it needs to be secured to the bottom back side of the frog. 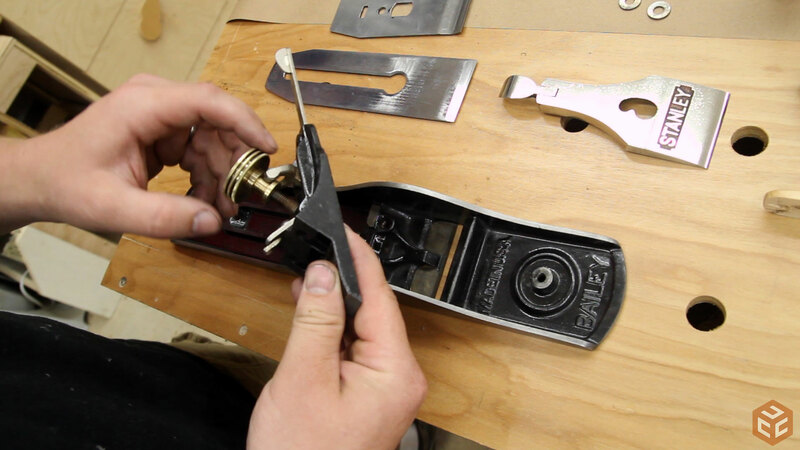 Next, the brass blade depth adjustment knob is screwed on. And the frog can be secured with a couple screws. Some plane models secure the frog in such a way that doesn’t require the removal of the plane blade. This one isn’t one of those planes. The blade will have to be removed every time the frog is adjusted. Luckily, adjusting the frog is very seldom done. The rear handle is held in place with two screws. And the front handle is held in place with one screw. The chip breaker is secured to the blade’s back side with a single, wide screw. It’s important that where these two surfaces meet near the cutting edge no light can pass through the mating joint. If there is a gap than that means it’s likely that shavings will clog up in the gap. 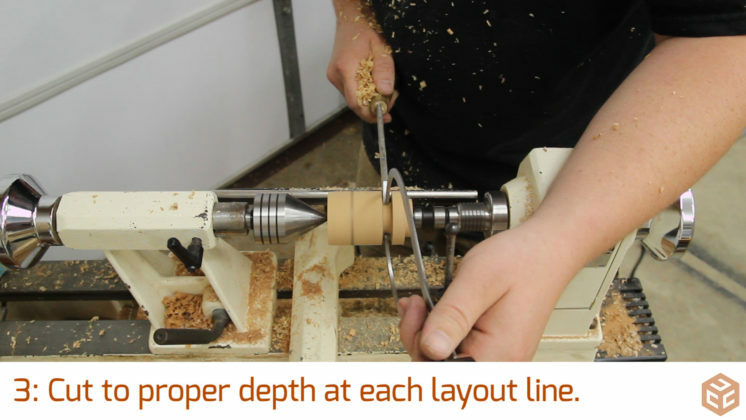 I always set my chip breaker to be about 1/32 or 1/16 of an inch away from the cutting edge. The blade and chip breaker rest on top of the frog. 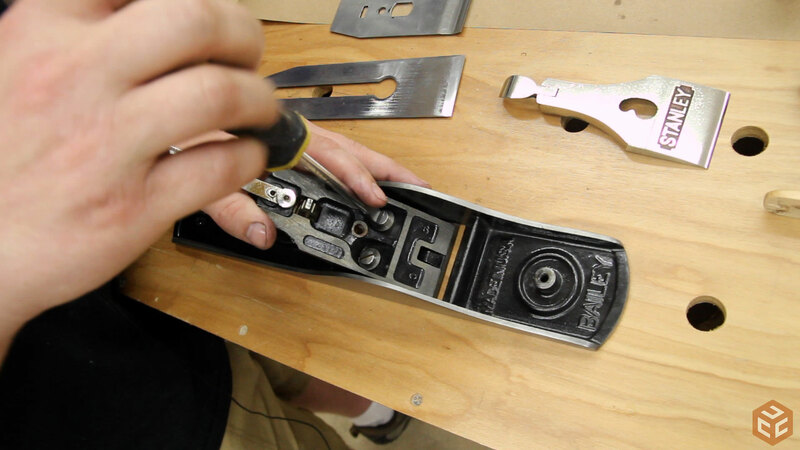 It’s important to make sure that he center of he blade is lined up properly with the left to right lateral adjustment lever near the handle before securing the lever cap. And finally the lever cap can be installed. With the lever in the tight position the lever cap screw can be adjusted so that it is as tight as possible while still allowing one finger to adjust the brass depth knob. 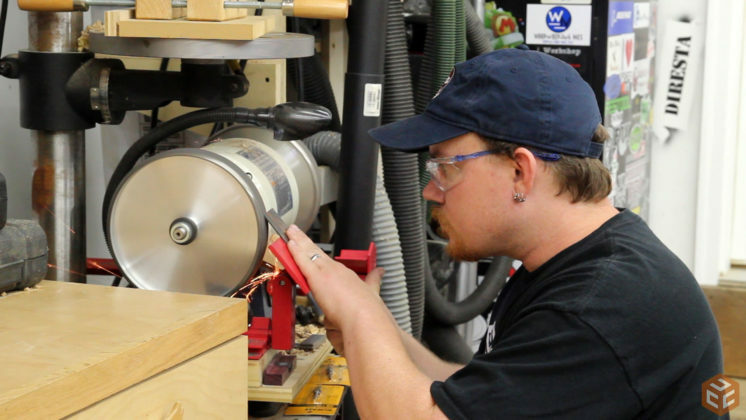 A common sign of the lever cap screw being too loose is the blade chattering while it’s trying to cut. 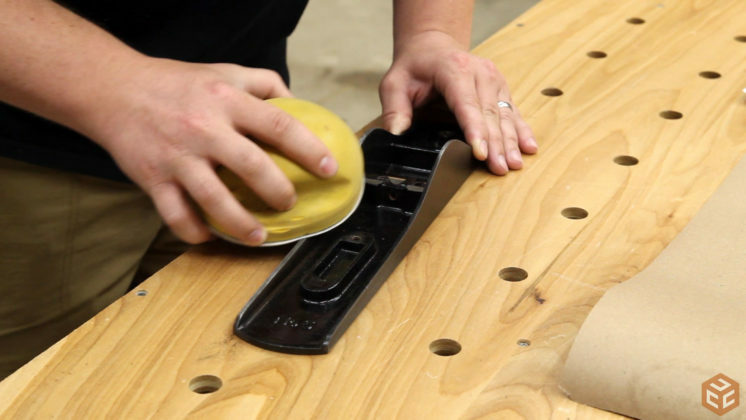 Right after installing the blade you will have to adjust the lateral position of the blade so that the cutting edge is parallel with the bottom of the plane. This is easily done by flipping the plane upside down and sighting down the plane bottom from front to back. 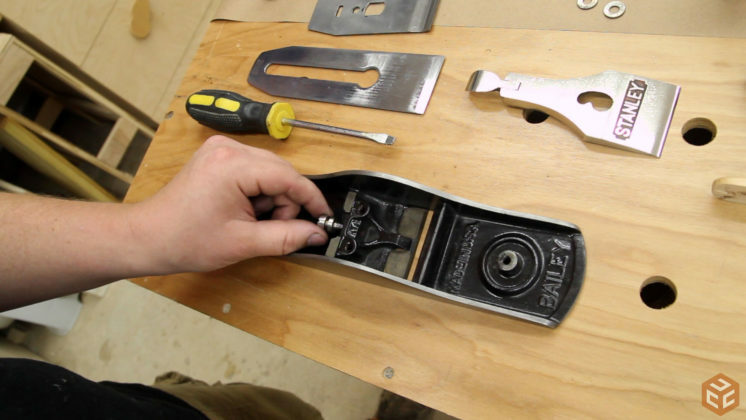 Advance the blade so that it can be seen and use the lateral adjustment lever to rotate the blade as needed. 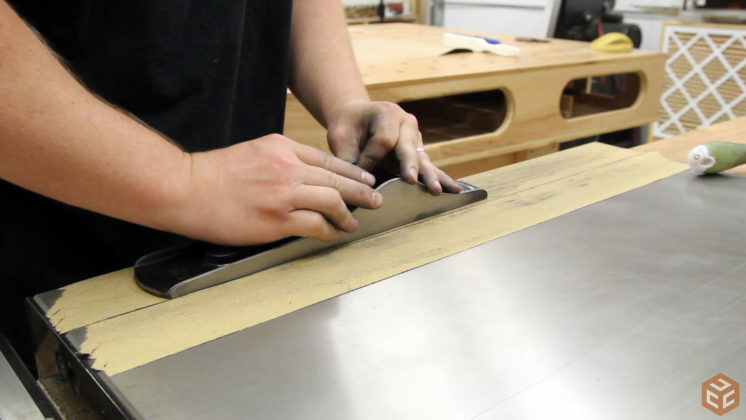 Once the blade is set by eye you can make fine adjustments while in use by paying attention to what side is cutting more and moving the lateral adjustment lever as needed. 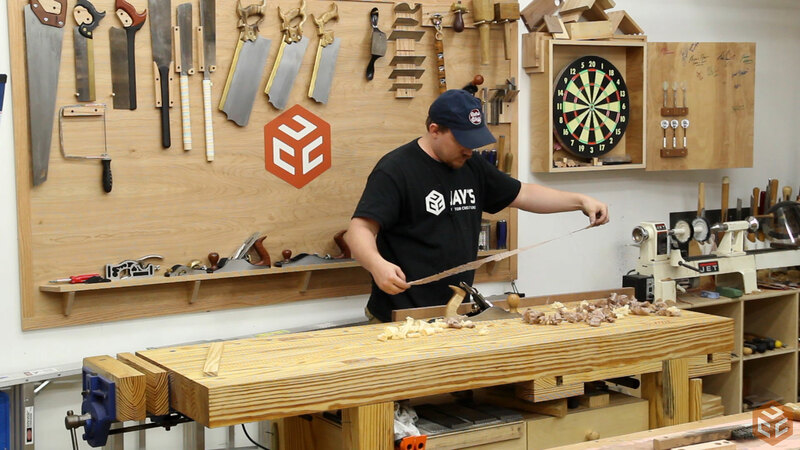 After quickly dialing in the plane I was able to get full length, see through shavings on a three foot board. 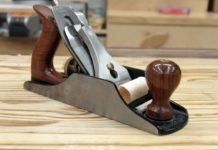 I hope you are able to get some encouragement through this article to restore a hand plane or two yourself. 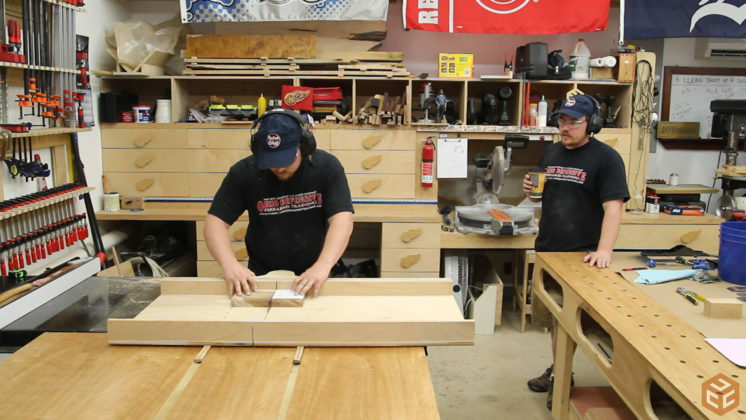 Depending on the condition of the plane you are starting with the process might involve a fair amount of work. But trust me, it’s worth it. There’s a definite sense of satisfaction after being rewarded with some wispy shavings on a plane you brought back to life. 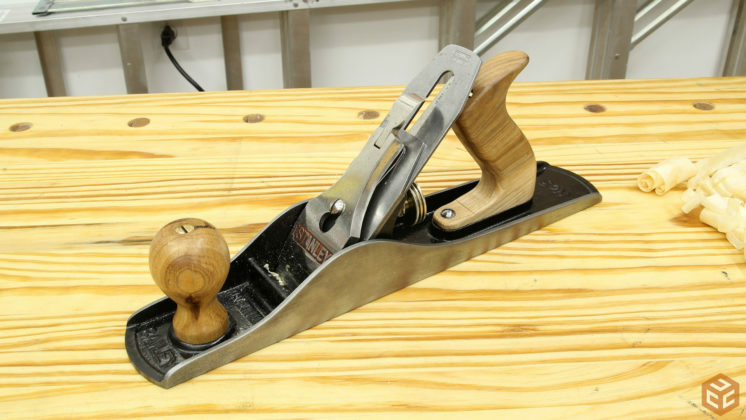 This is typically where I insert some clever saying or word usage about a plane or thin shavings…but I’ve got nothing. Have a good one folks! Great video…not only covering the restoration, but also explaining how the components interact to produce a tool that performs as it should. Nice job! After watching Paul Sellers restore a #4 I took the plunge a couple weeks ago and brought one back to life. 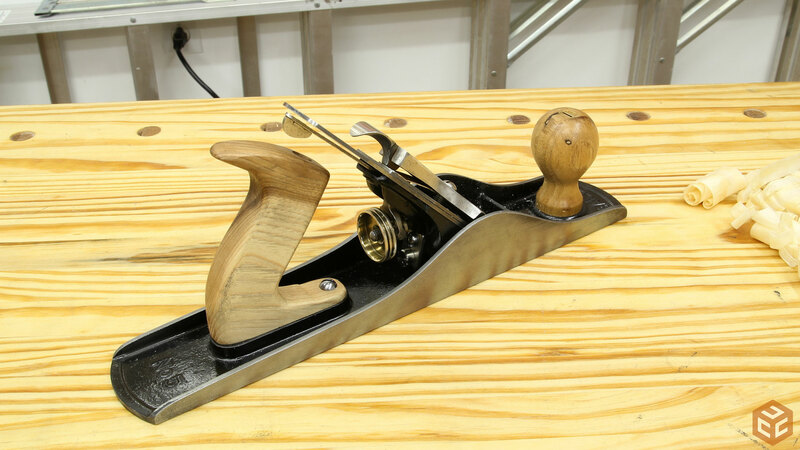 I really enjoyed it and so far it cuts as well as my “purchased new” planes. 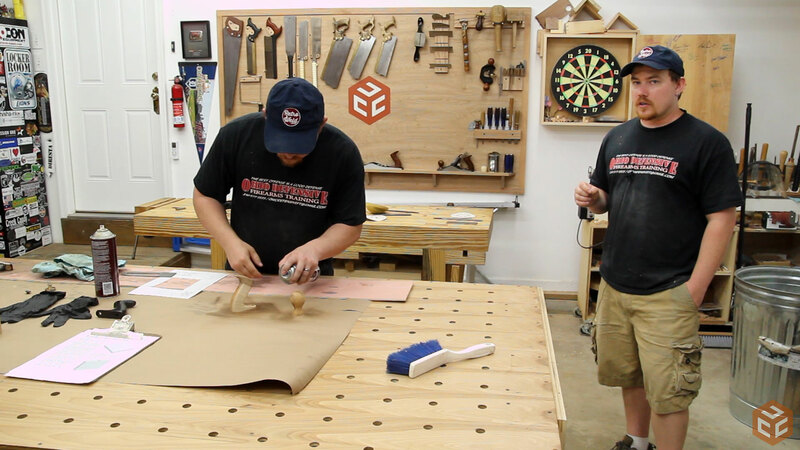 I’ve learned a great deal from you and Paul- Obviously two different styles but that’s what makes it so interesting. 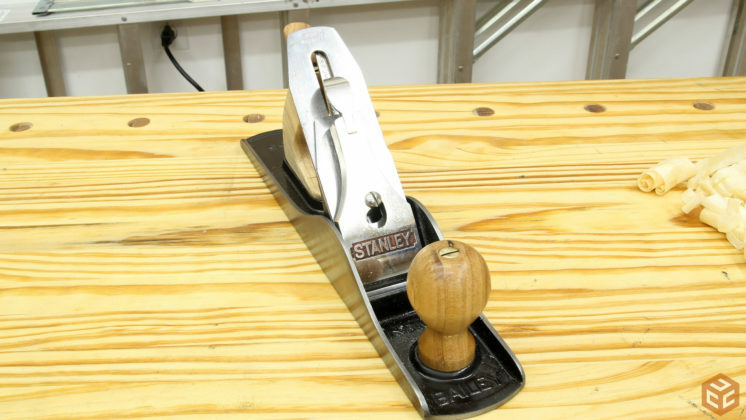 Debating now about bidding on a Stanley 71 or purchasing a new Veritas. Thank you for the feedback, Rod. I appreciate it. 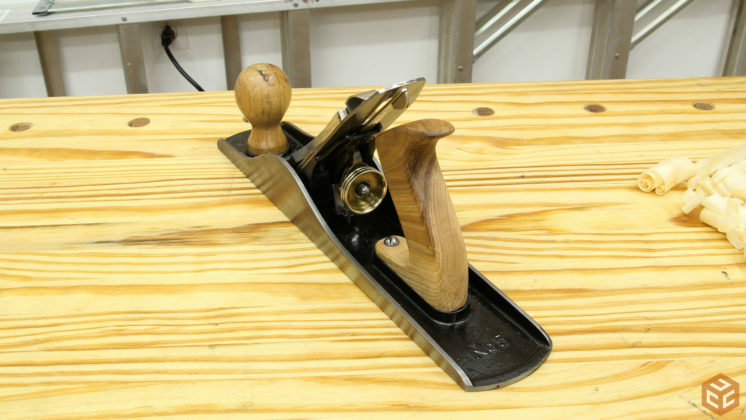 I received the Veritas router plane as a gift. It’s really nice. Nice! I restored 3 about a year ago. #3,#4, and a #5. Spent way too much time on them. One was really rusty and I used electrolysis (water and borax solution, auto battery charger, scrap steel, and 24 hrs later it looked a lot better. Found the instructions on line somewhere. Keep the vids coming. You can definitely spend a lot of time restoring. That’s for sure. Jay Are you spying on me in my shop ? 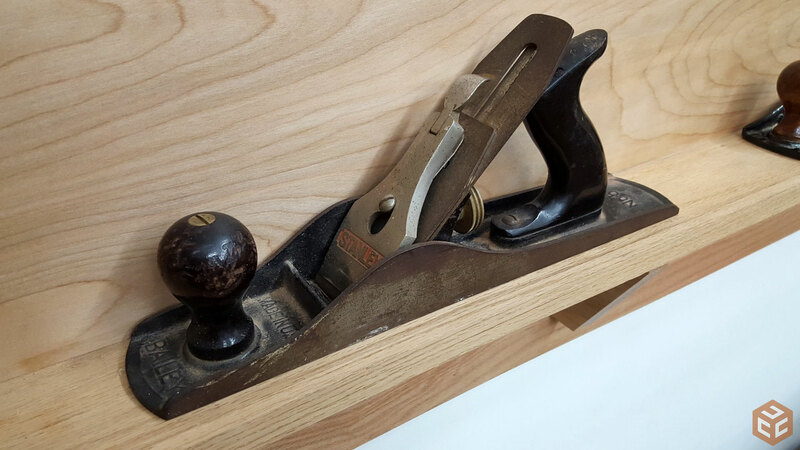 Three days ago I came across and old plane somebody gave me ( Made in USA is the only marking) and was going to look up how to clean and tune it up for my use. So upon looking for a camera of some kind hidden my shop and not finding one , I have come up with this answer ” You are a Clairvoyant”……..
Great video and you have made it so simple for all who need it …..
hahahaa. This video has been on the back burner for a few months now. Nice work Jay! 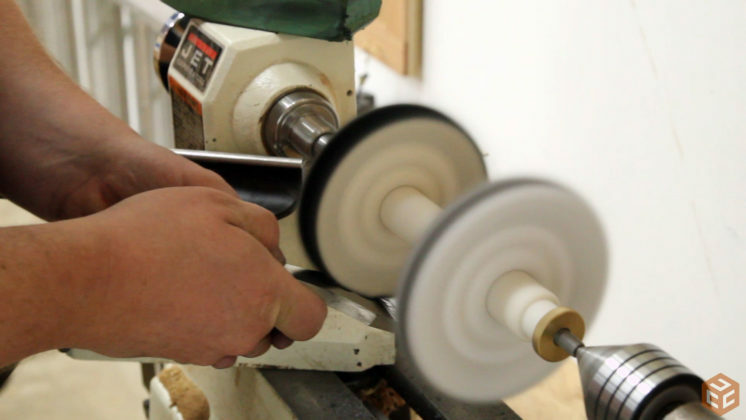 What type of grinding wheels are you using? Thank you very much for the feedback Thom. Finally a video that explains what each component does and how to adjust them. 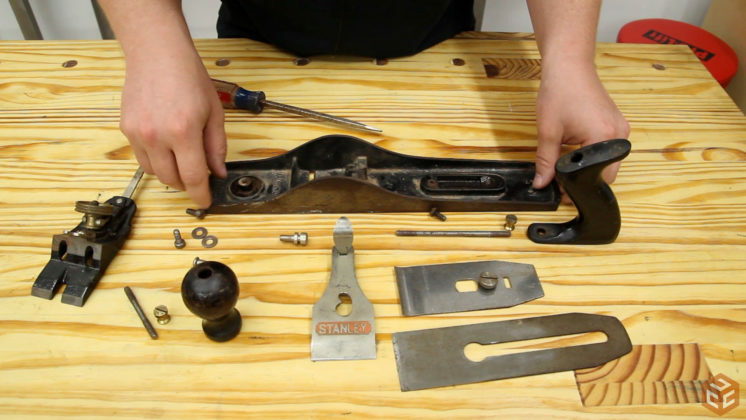 I have a plane here that need some TLC but I didn’t know (until now) how to go about it. Many Thanks, love your videos. Great work Jay! 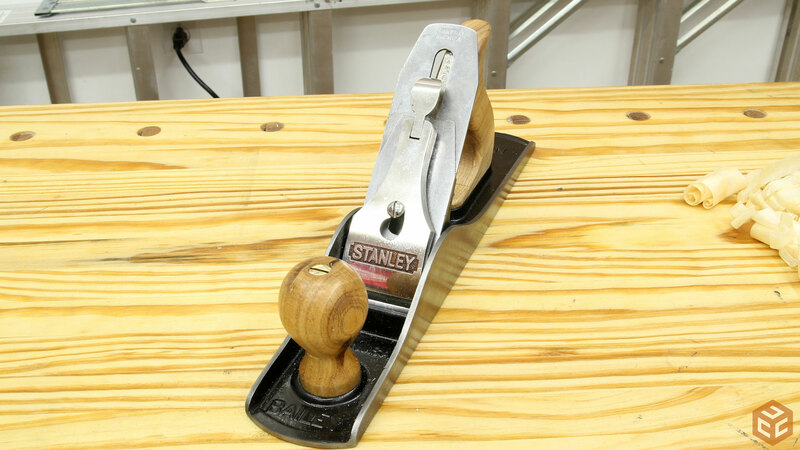 Wonderful to see such a useful tool restored so well. 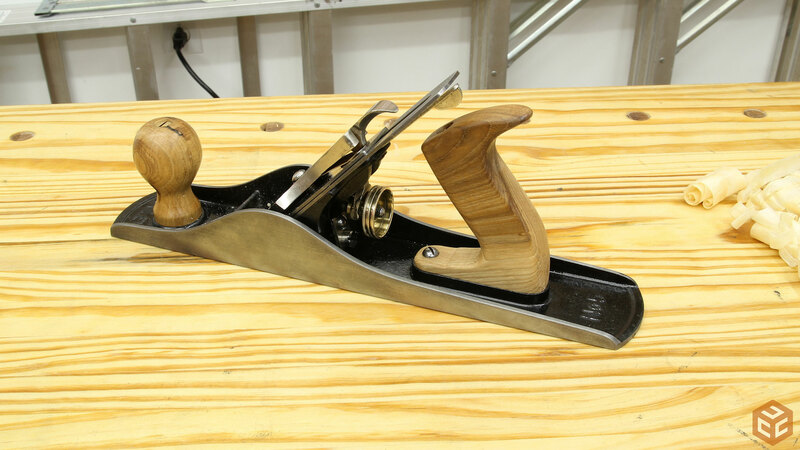 I attempt to maintain my shop tools as I go and I try to dedicate time periodically to give them their own necessary TLC but we all have at least one tool we neglect. Thanks for the extra motivation. Read the article and watched the video, great stuff, Going to save this one, great in depth information. A couple of things I learned. Your technique using the plane could be better. The front knob should be used to apply down pressure. Your palm should be on top. As for tuning the plane, you need to smooth the mating surfaces. Like where the frog mates with the body. This takes some time and is quite tedious. The blade can be sharpened as you did. Another option would be to purchase a new blade such as a Hawk. 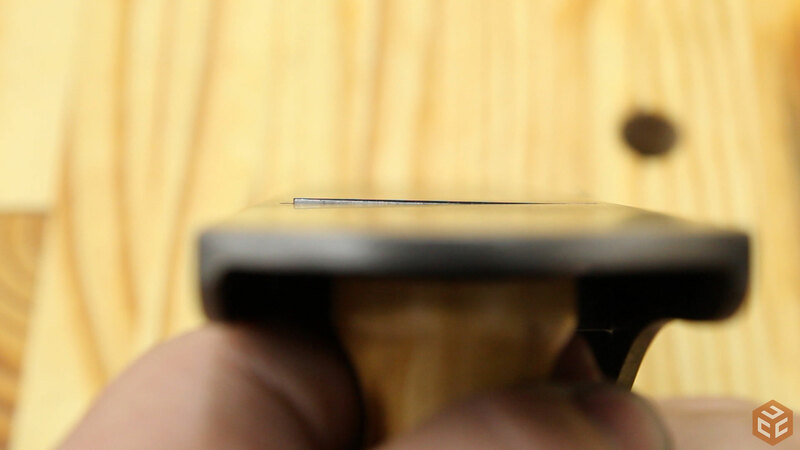 The blade is thicker than the original so less vibration. The mouth as well as the flatness of the body are also important places that need attention. 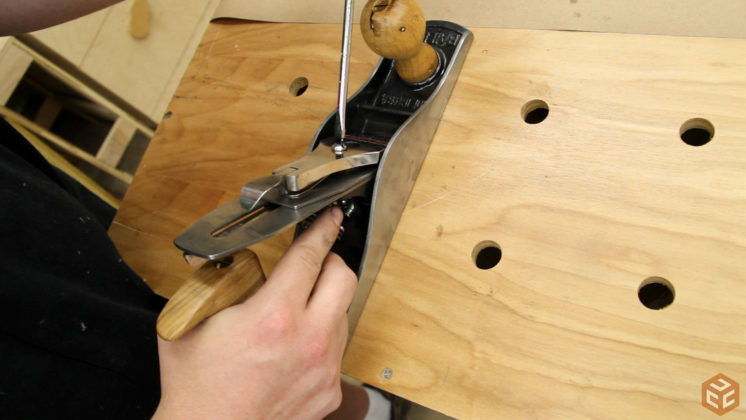 I have a suggestion, when I was in shop class, the shop teacher showed us to take the chip breaker and turn at right angles using a square, tighten them together thus giving an edge to slide on tool rest of your bench grinder rendering a square grind on your blade. 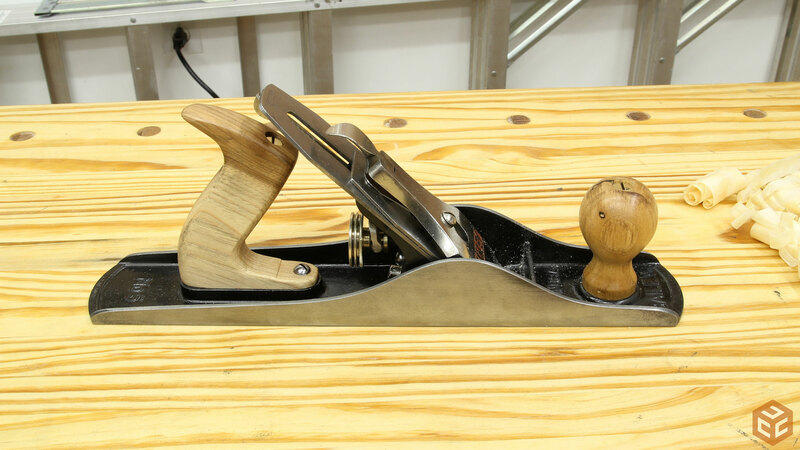 I bought this same unit plane from a thrift store and I cannot wait to start the restoration on it. Thanks Jay for the how to on every step. Hi Jay, very nice work! I found the best thing to remove rust is Evapo- Rust from Harbor Freight. It is environmentally safe and non toxic.